Some additional analysis and commentary will be provided here that reveal a yet-to-be discussed major implication of the CBO report -- almost the entire burden: a) of all transfer payments made to American households and b) of all non-financed https://www.naturalnews.com/government.html>g... spending, falls on just one group of Americans -- the top one-fifth of US households by income. That's correct, the CBO study shows that the bottom three income quintiles representing 60% of US households are "net recipients" (they receive more in transfer payments than they pay in federal taxes), the second-highest income quintile pays just slightly more in federal taxes ($14,800) than it receives in government transfer payments ($14,100), while the top 20% of American "net payer" households finance 100% of the transfer payments to the bottom 60%, as well as almost 100% of the tax revenue collected to run the federal government. Here are the details of that analysis. The figures in Row 6 in the table above (and displayed in the graph above) show the amount of federal taxes paid by the average household in each income quintile minus the average amount of government transfers received by those households in 2011. 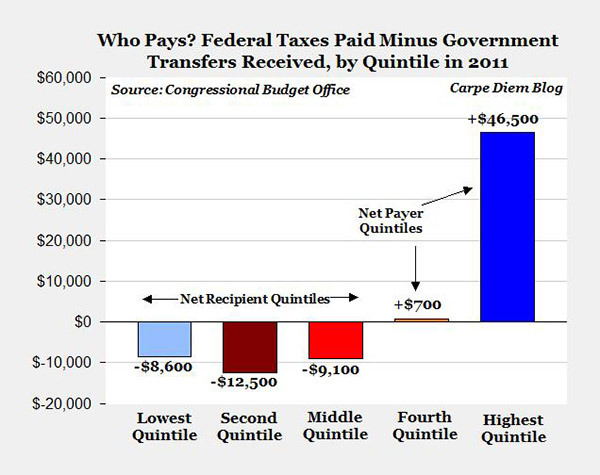 For each of the three lower income quintiles, their average government transfer payments exceeded their federal taxes paid by $8,600, $12,500, and $9,100 respectively, and therefore the entire bottom 60% of US households are "net recipients" of government transfer payments. 14. 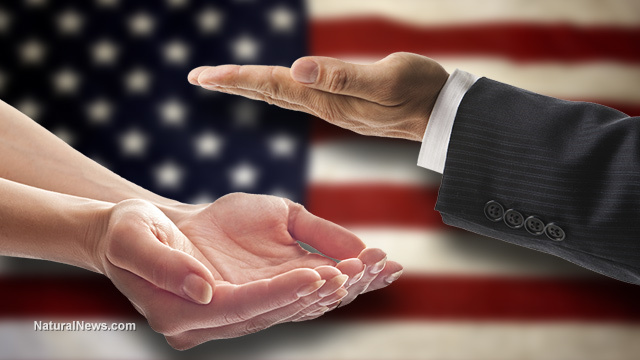 At this point, the federal government runs about 80 different "means-tested welfare programs", and almost all of those programs have experienced substantial growth in recent years. 19. According to one calculation, the number of Americans on food stamps now exceeds the combined populations of "Alaska, Arkansas, Connecticut, Delaware, District of Columbia, Hawaii, Idaho, Iowa, Kansas, Maine, Mississippi, Montana, Nebraska, Nevada, New Hampshire, New Mexico, North Dakota, Oklahoma, Oregon, Rhode Island, South Dakota, Utah, Vermont, West Virginia, and Wyoming."